It's monthly favourites time again! February has been such an awesome month in terms of new releases! With that said, this post is probably going to be quite big (because we all know I struggle to cut back when it comes to favourites) but I will try and narrow it done. It has been a good nail art month for me. I'm really hoping that it continues into March but I know that the Digit-al Dozen theme isn't a good one for me so that may throw me off. Time will tell I guess. 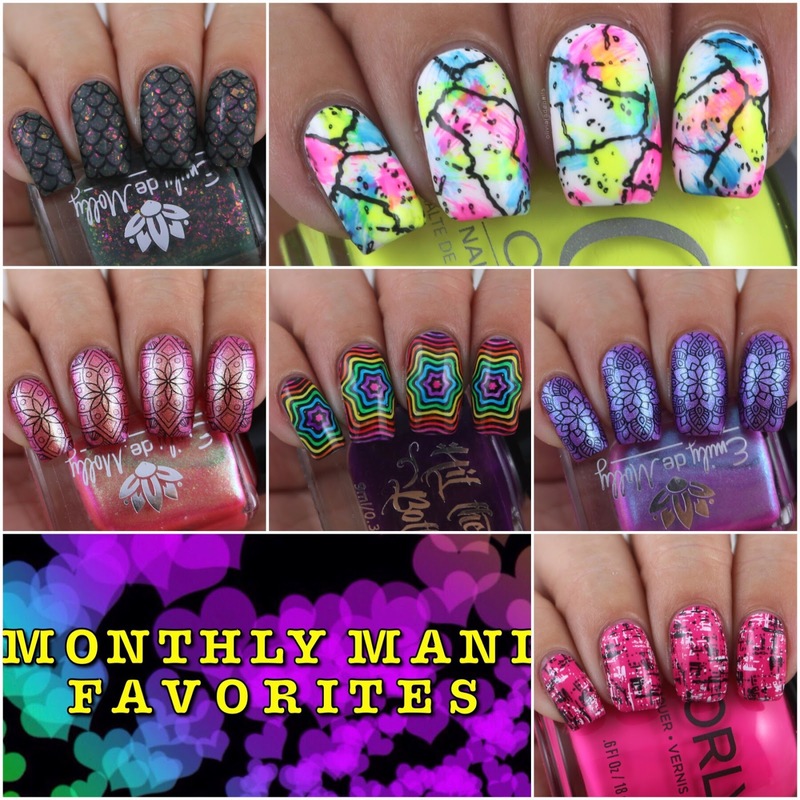 Anyway, these are the manis that I loved this month! I tried a few new stamping plates this month, however there aren't any that I would consider "favourites". I managed to get my hands on two new mainstream collections, however only managed to swatch on of them (I will have the new China Glaze collection on my blog in the next couple of days). I love this collection. The formulas across the collection aren't the worlds greatest but I do love the colours! You can find my original swatch and review post here. OMG! The indie girls have killed it this month with their releases! If this month is anything to go by then there are going to be a whole lot of empty bank accounts this year! This month EdM released some of what I would consider my all time favourite polishes that they have made. 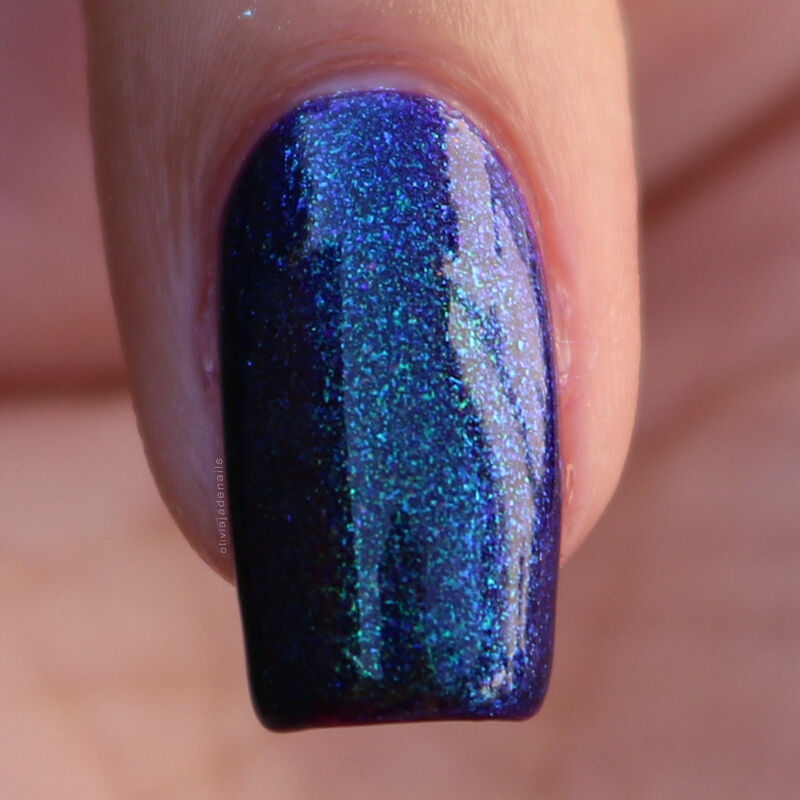 There are soooooooo many amazing polishes in this release. I honestly couldn't recommend these polishes enough. 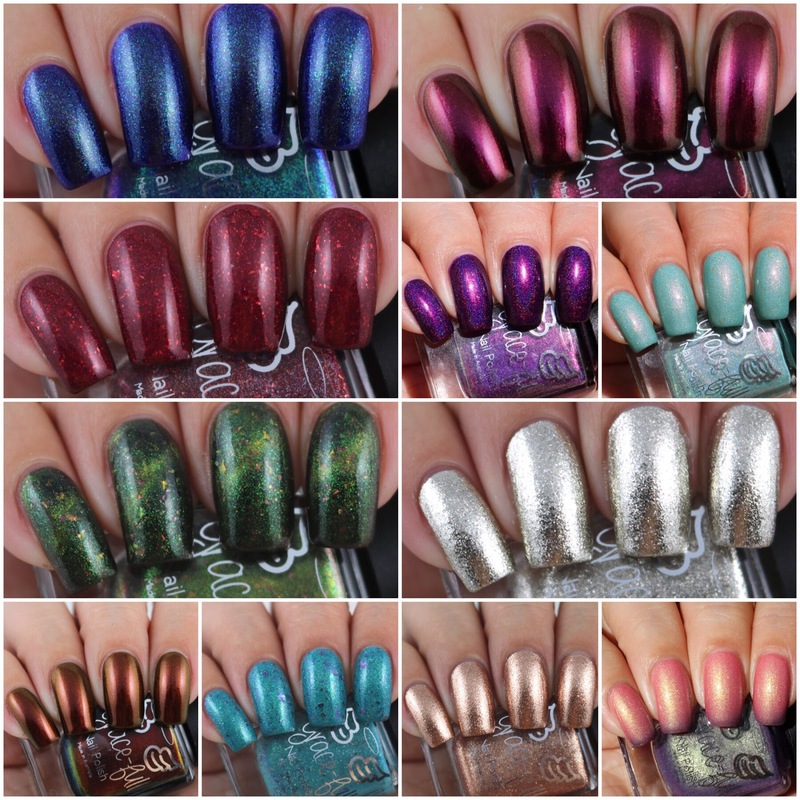 You can find more swatches and my review here. 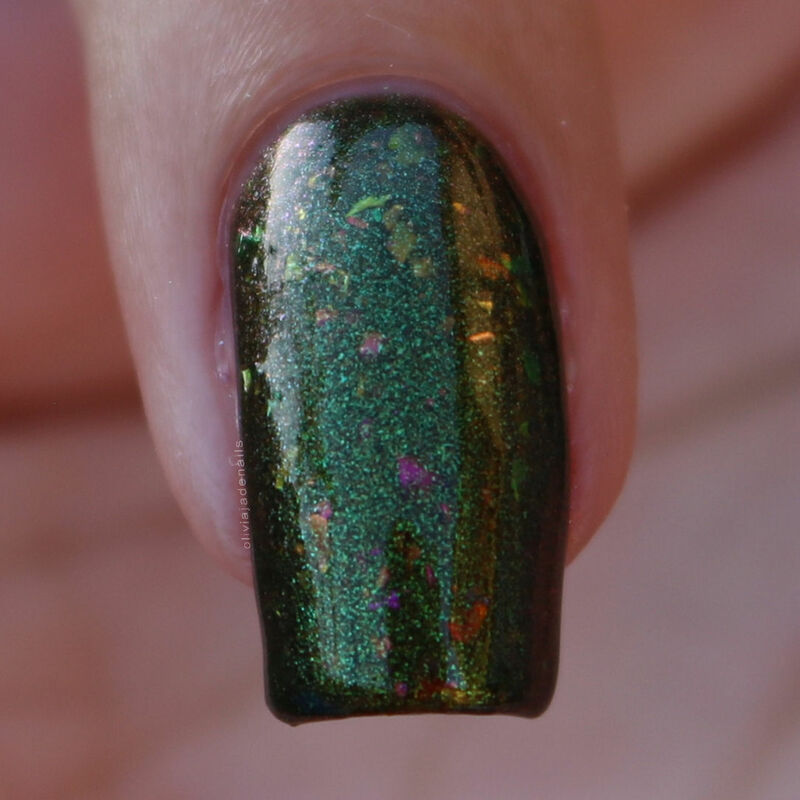 I do go back and forth on this polish and whether I should include it in this post, but for a green polish (which isn't normally my colour) I really like it. When thinking about what I have swatched this month this polish was one of the polishes that popped into my head so that is a sign that it should be included. These limited edition polishes that are released each month are a killer for me. Last year, I made the decision to cut all of the monthly limited edition polishes out of my end of year favourites (mainly to make my decision making easier) but I'm not sure what I'll do this year. Whatever that decision is it isn't going to stop me adding some into my monthly favourites. This polish is drop dead gorgeous and the formula is amazing. It's definitely one that I think everyone should own! As a big Harry Potter fan this collection is awesome. I honestly could say that all of these polishes are a favourite of mine but I am going to be tough and say that there are four favourites - Unicorn Claret, Stan's Wheels, Ginger Ninja and O Dumbledore, My Dumbledore. I'm totally obsessed with Hit The Bottle's Jelly Shot Collection. The colours are so good, and they are easy to work. I am excited to play with these some more. I feel like I am forgetting something in this post but I can't think of what. If by some strange reason I do work out what I have missed (and if I have actually missed something) then I will be sure to add it in. What have you been loving this month? We are literally days away from the March Polish Pick Up releases. Yesterday I shared with you the new polish from Emily de Molly and today I have the polish from Grace-full Nail Polish to share. I hope you have your wallets prepared. Midnight Lotus is a vibrant purple with aurora shimmer, flashes of blue and ultra chrome chameleon flakes in pink, gold, blue and violet. 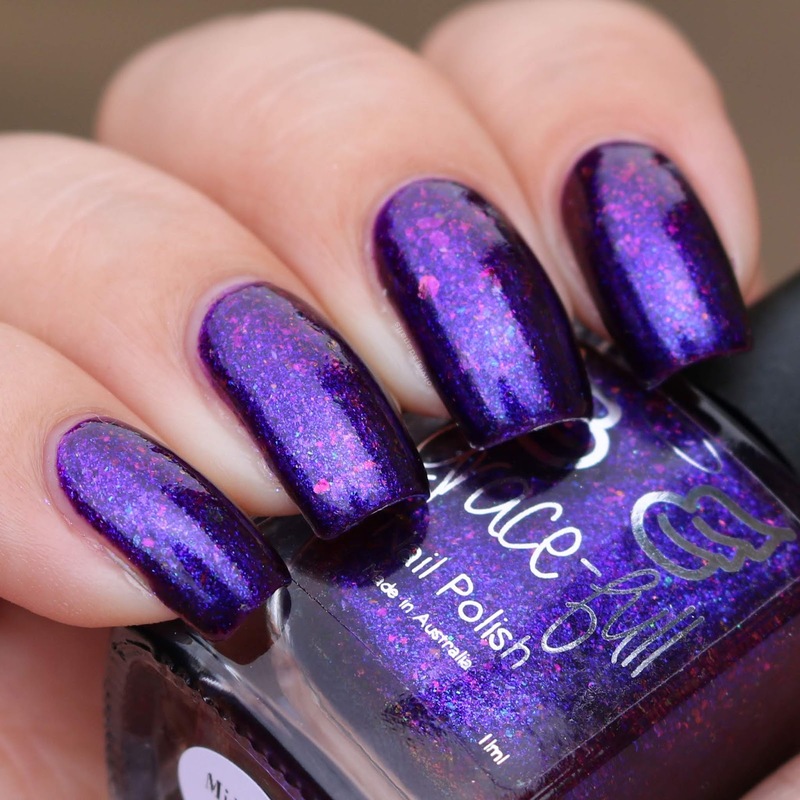 This polish is inspired by Prince's album Lotisflow3r. It's safe to say that I absolutely love everything about this polish. The base colour is absolutely gorgeous and the flakes are stunning! The formula is also awesome and is opaque in two coats. I think that this is one of those polishes that looks a million times better in person than in pictures. It's a truly stunning polish. 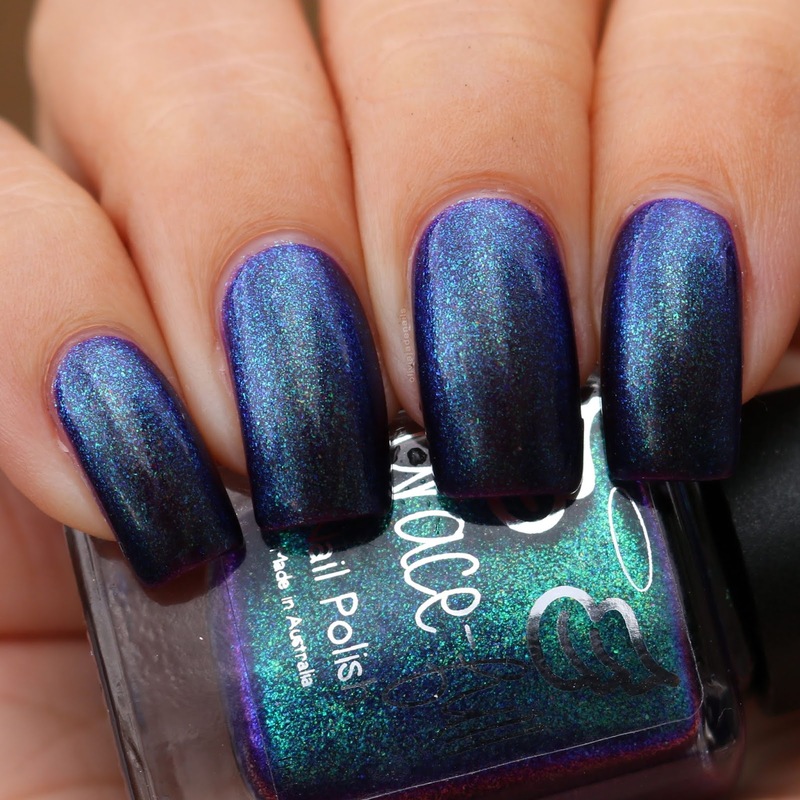 Midnight Lotus will be available via the Polish Pick Up from 1st March at 11am EST until Monday 4th March. 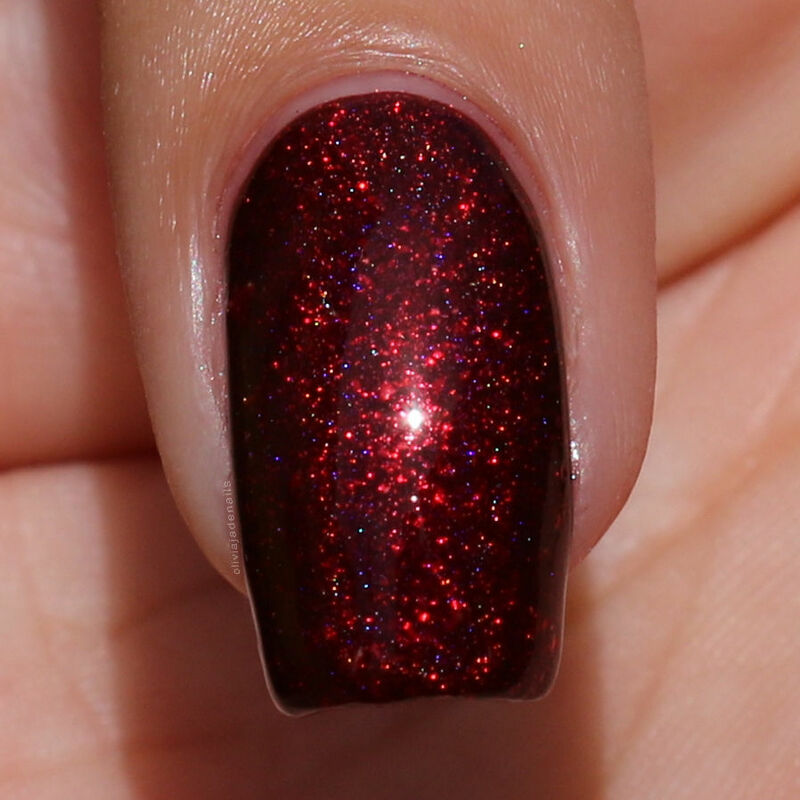 This polish is capped to 140 (US) and 15 (UK) so you know that if you want it then you need to be quick! 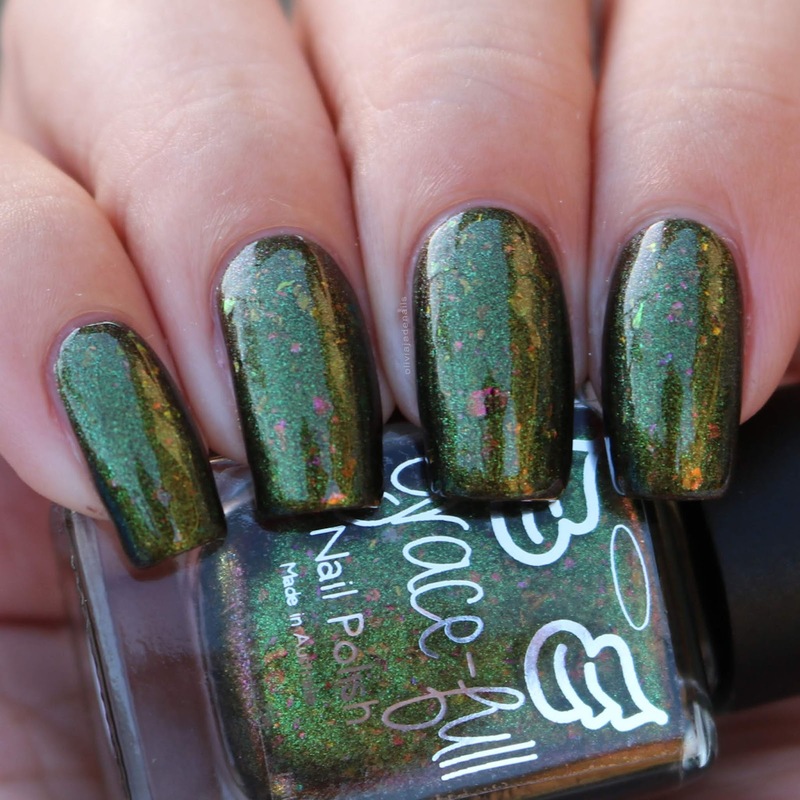 Last month Grace-full Nail Polish's shade sold out super quick and left a lot of sad people. Don't let that be you this month! As we are reaching the end of February (which has flown by!) 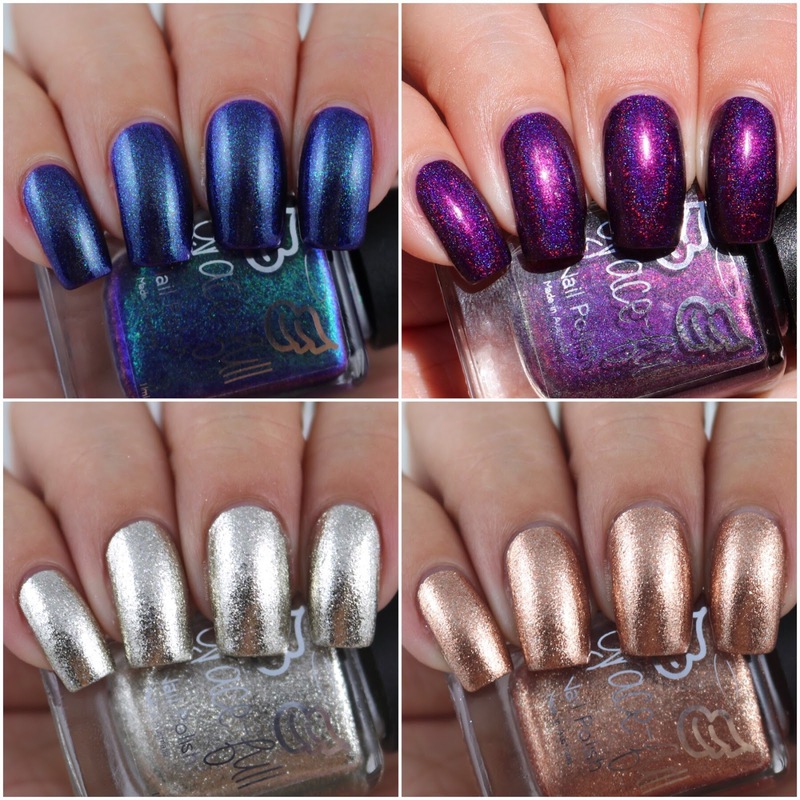 it is time to look at March's Polish Pick Up. Yes, that's right - it is nearly Polish Pick Up time again. This month I have two of the polishes that are being released. I have the Emily de Molly shade (which I will be sharing with you today - yay!) and then I will also have the Grace-full Nail Polish shade tomorrow so stay tuned for that. Let's take a look at this beautiful Emily de Molly shade. Hide The Sun is a teal green base filled with silver holographic micro glitters and tones of iridescent flakes that shift through orange, gold and green. Now greens aren't really my colour (I usually go for pinks and purples) but this one I am a really big fan of! It's really beautiful colour and the flakes are amazing! The formula is great and so easy to use. I used three coats for my swatch, however you can stop at two coats. There is no visible nail line at two coats but it is a bit see through at the tips in direct light. I do just love the added depth of the third coat. 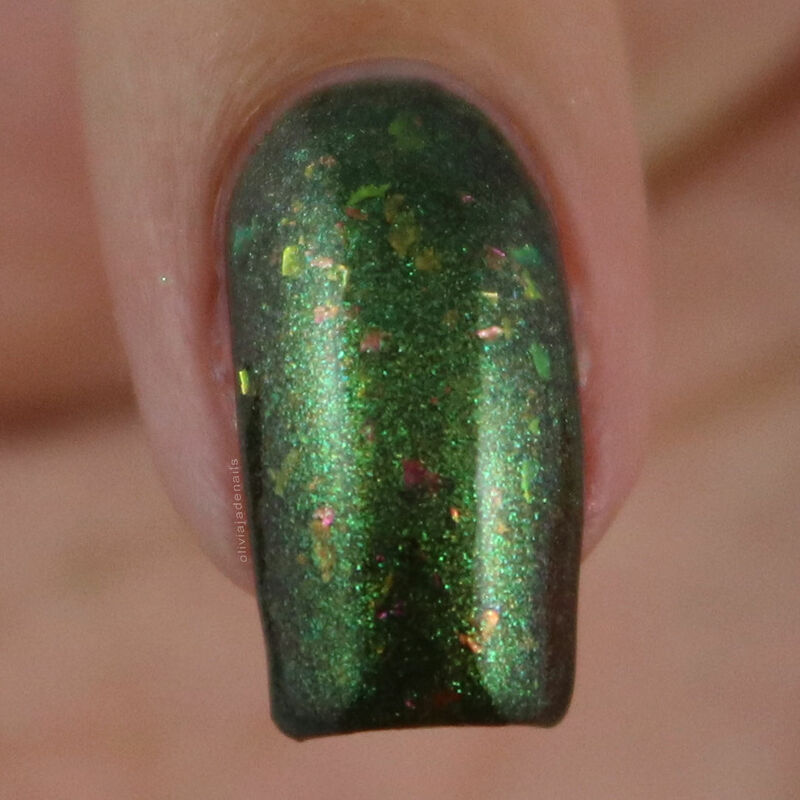 I imagine that if you like green polishes then you will LOVE this one. I mean, I'm not normally a green fan but this one I really like! 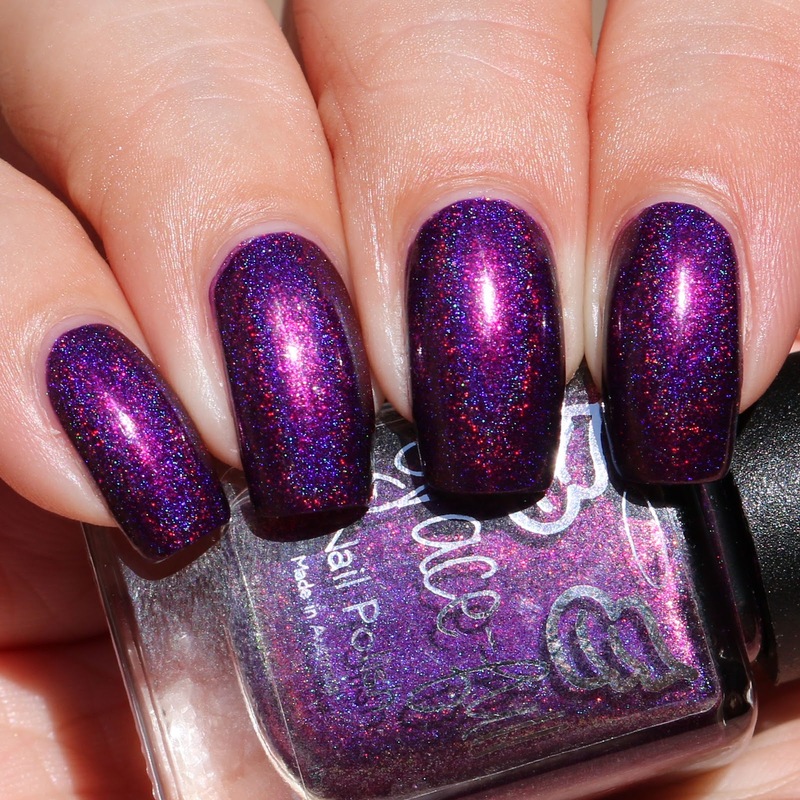 Hide The Sun will be available via the Polish Pick Up from 1st March at 11am EST until Monday 4th March. There is no cap on this polish, however don't forget that after the 4th this polish won't be available. Grace-full Nail Polish are back with a brand new collection (and their first for 2019) and I am so excited to share it with you. 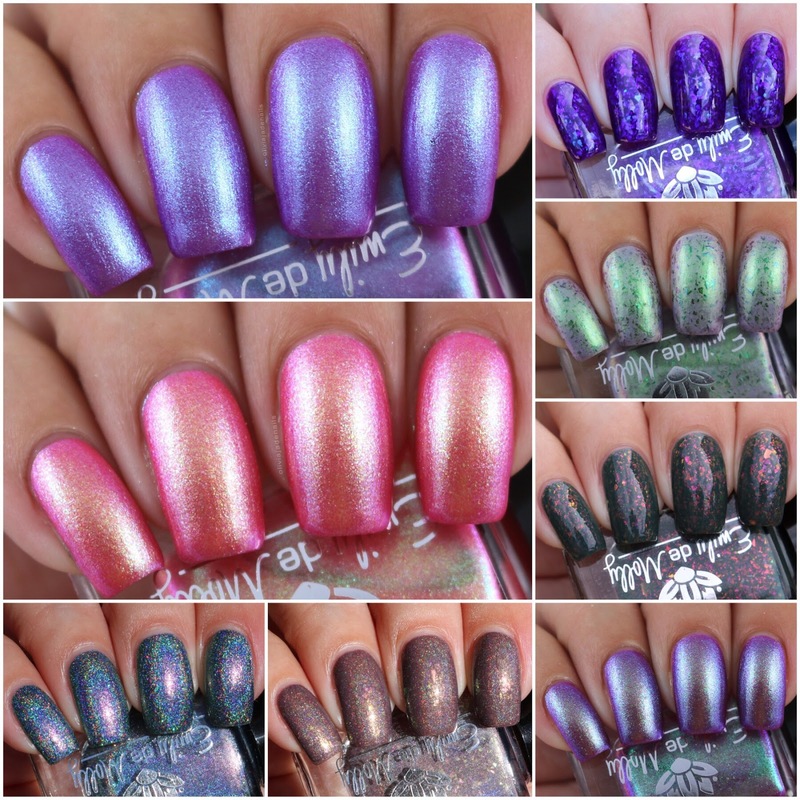 The Wizards And Magic Collection is inspired by Harry Potter and has eleven polishes - one thermal, three holos, two metallic flake foils, two multichromes, a magnetic and a shimmer with aurora pigment. This collection definitely has something for everyone in it! As usual, this post is quite picture heavy, but sometimes you just need the extra pictures so show the pretties. 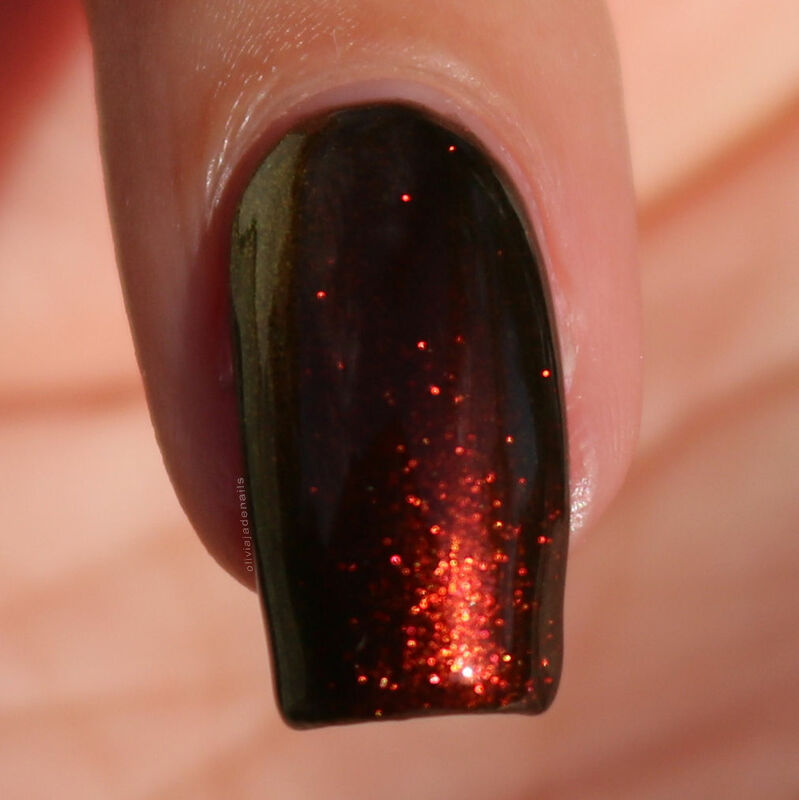 Chosen One is a maroon linear holo with UCC flakes and aurora shimmer that gives a depth to the holo. This polish is inspired by Harry Potter. 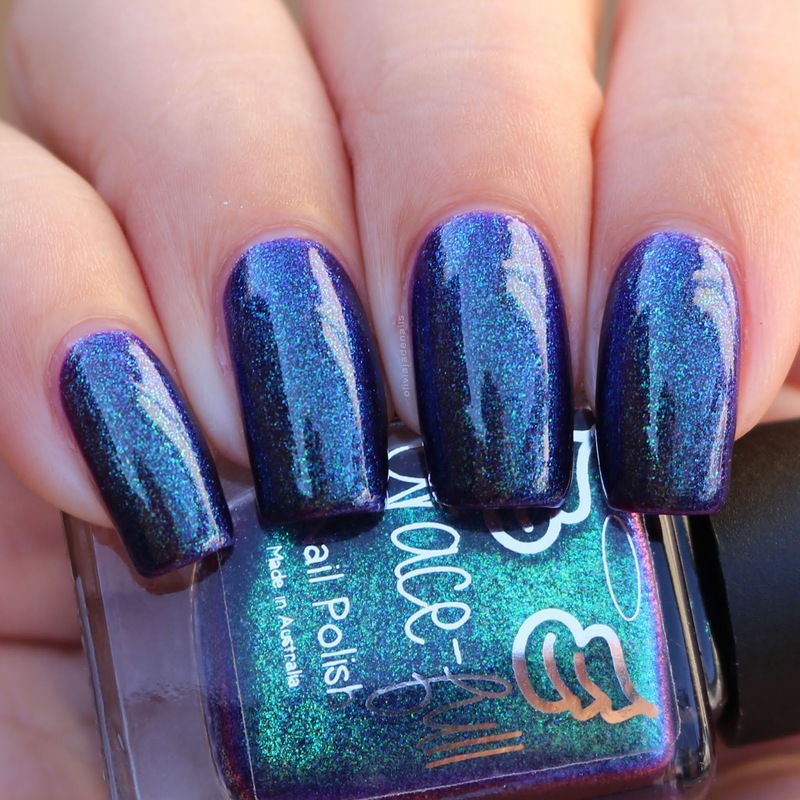 I think that this is such a beautiful colour and the formula is awesome! My swatch shows two coats. 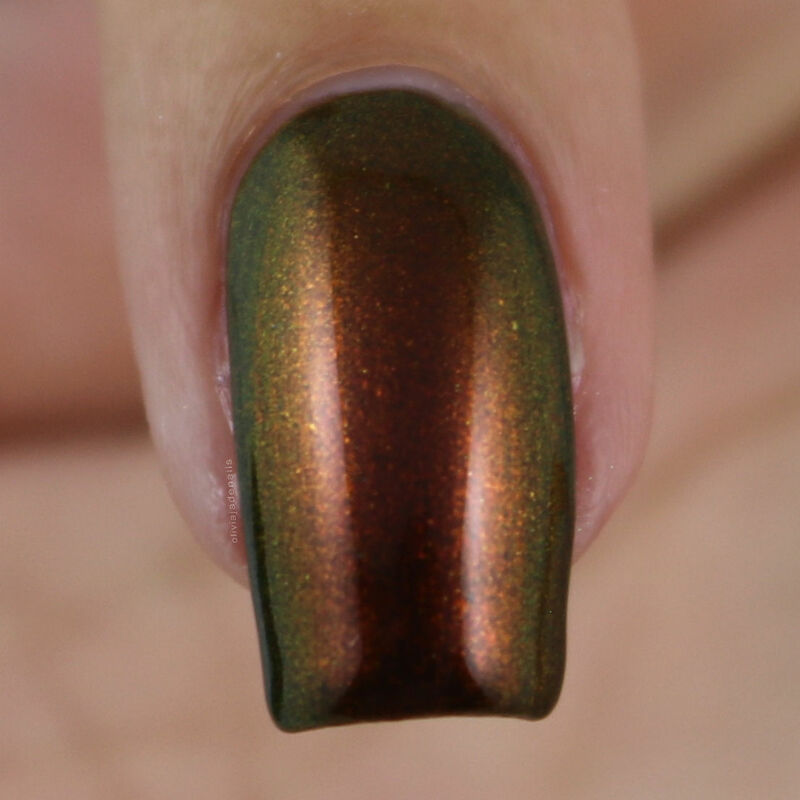 Dragon Keeper is a multichrome that moves through red, bronze and copper and is inspired by Hagrid. This one has a good colour shift to it. I found that the first coat of this one was a little thin/sheer but it does build up on the second coat. I used three coats for my swatch, however you could stop at two coats. It was just a little see through at the tips for my liking. Everybody Loves Luna is a thermal that is a muted purple in its coldest state, pinky purple when transitions and peach when it is at it's warmest. It is filled with golden shimmer that really pops especially when it is in it's warmest state. This polish is inspired by Luna. Funny story about this one. When I first saw it it was coral and I remember thinking how stunning it was. But when I went to swatch it I couldn't find it. Clearly didn't realise it was a thermal at the time. 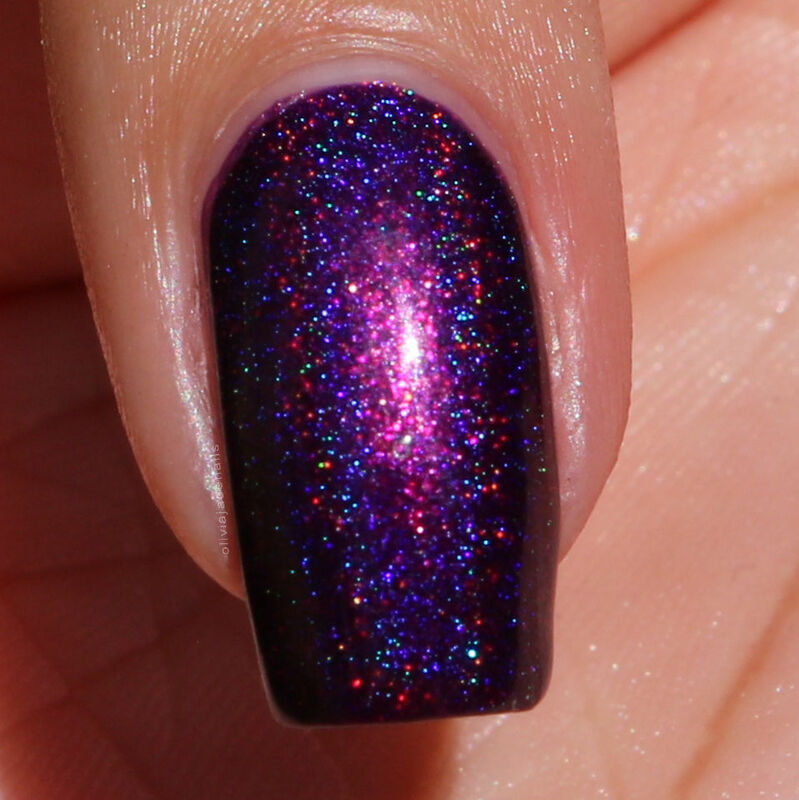 Anyway, this polish transitions between the shades really well and is gorgeous in all states. The formula is great and easy to use. I did question if I could stop at the second coat, however it did have a questionable visible nail line when warm (or my eyes were playing tricks on me). My swatch shows three coats. Ginger Ninja is a metallic flake foil that is full of copper metallic flakes and a smattering of silver flakes for extra shine and sparkle. This polish really does shine! I love the colour and the formula is so easy to work with. You do need to be careful with application because clean up can be quite messy. 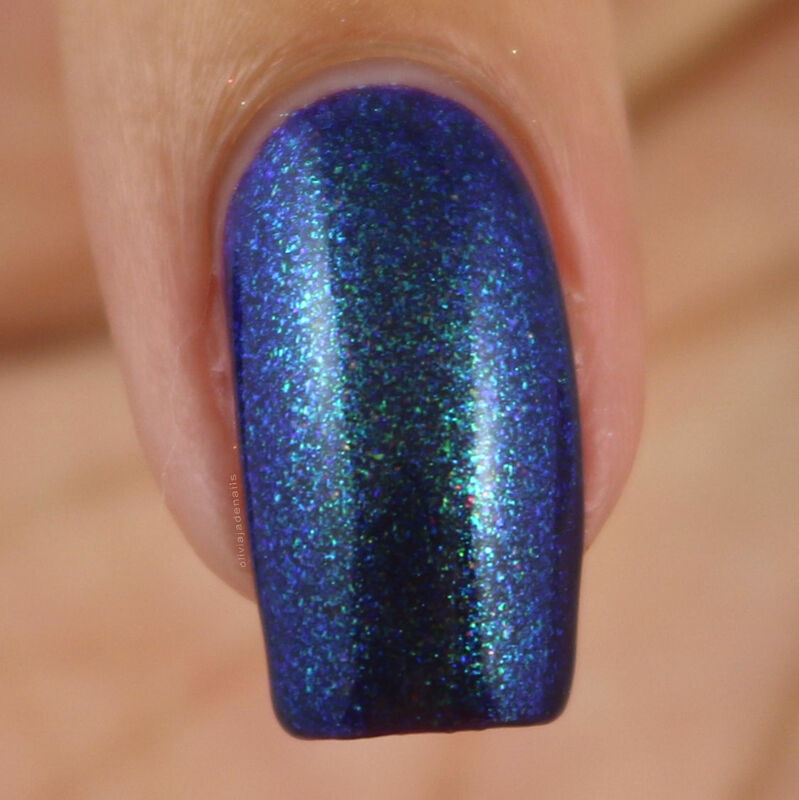 This polish would make for a great base for nail art or as an accent nail as well. I'm definitely going to have a lot of fun using this one. My swatch shows two coats. Griffindor's First Lady is a magnet with a forest green base, colourful UCC flakes and light green and gold magnetic pieces. 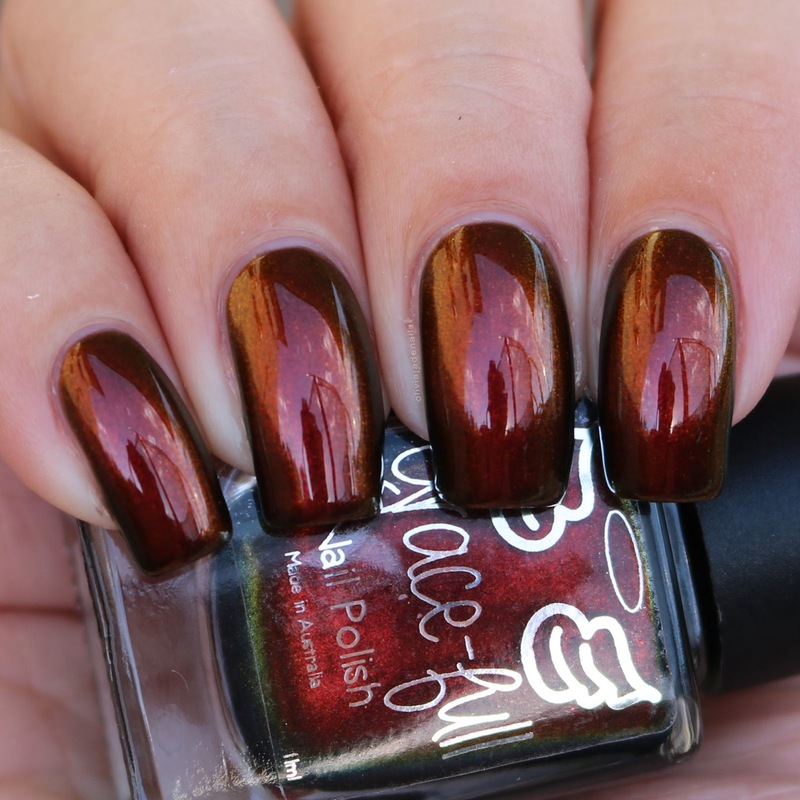 This polish is inspired by Professor McGonagall. This is such a nice polish. The formula does seem a little thing on the first coat, however it does build up nicely on the second coat. You can stop at two coats, however I used three coats for my swatch. Keeper Of The Diary is a mint green creme holo with a flash of pink and has gold flakes scattered throughout. 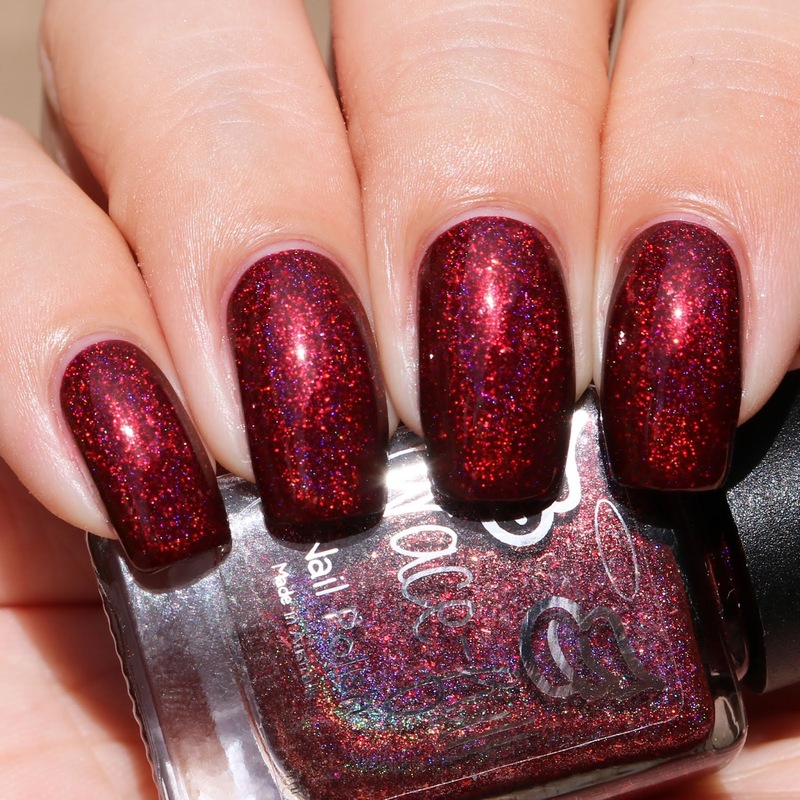 This polish is inspired by Ginny and her Yuletide ball gown. This polish is gorgeous, especially with that flash of pink! The formula is great and applies evenly. I used two coats for my swatch. 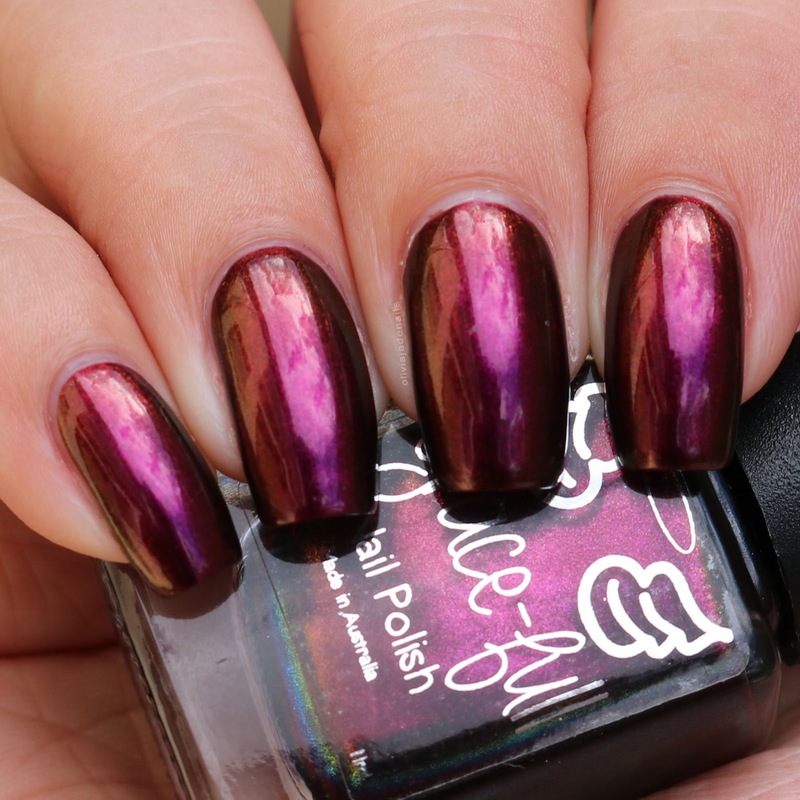 Little Miss Perfect is a multichrome that moves through pink, red and copper. 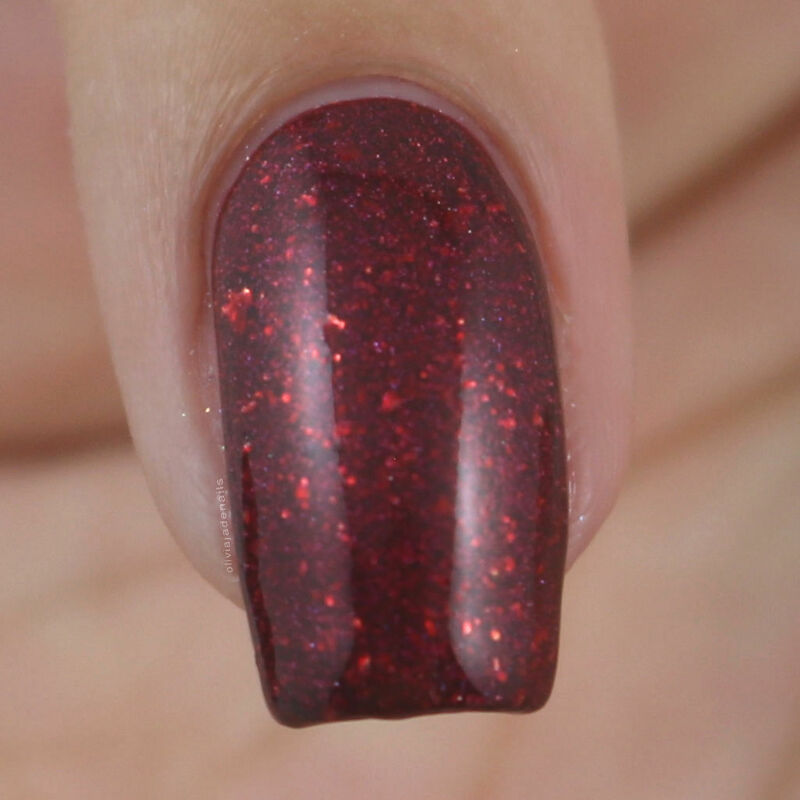 This polish is inspired by Hermoine and her Yuletide ball dress. This one is gorgeous and shifts between the shades well. It is really hard to capture the colours in pictures but you can see them in person. For my swatch I used two coats. O Dumbledore, My Dumbledore has a purple based with green-blue aurora shimmer and of course is inspired by Dumbledore. This polish is magically! On the first coat (which is a little patchy) it looks purple, but on the second coat is changes to blue. It's so crazy, but oh so gorgeous! I love it! This polish is opaque in two coats. Sev is a light teal crelly with UCC flakes in purple, purple, teal and navy. 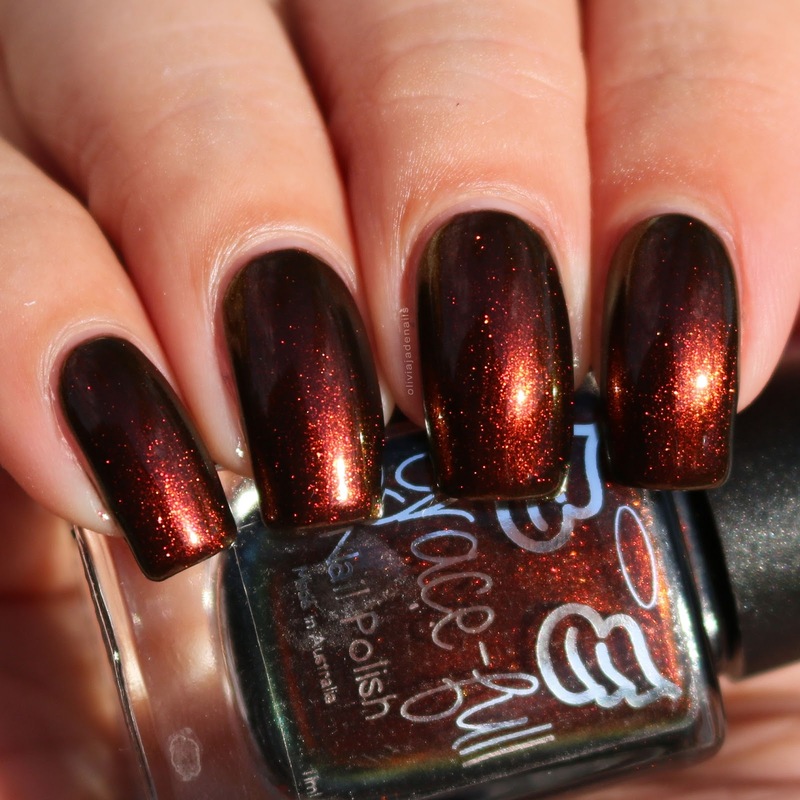 This polish is inspired by Severus Snape's heroic softer side. I love the colours in this polish. I think they look so good together. The formula is easy to use and applies evenly. I used three coats for my swatch, however you can stop at two coats. Stan's Wheels is a vibrant purple holo with a pink flash. I love this one! The colour is absolutely stunning and the formula is amazing. My swatch shows two coats. 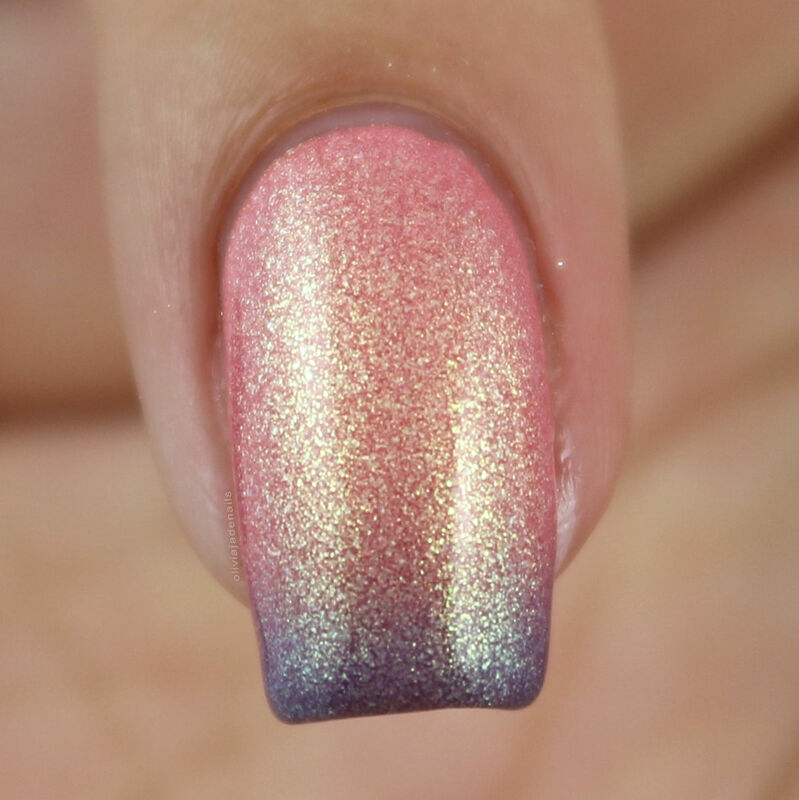 Unicorn Claret is a metallic foil with silver flakies and a smattering of holo flakes throughout. This one is gorgeous and sooooo sparkly! I love it! 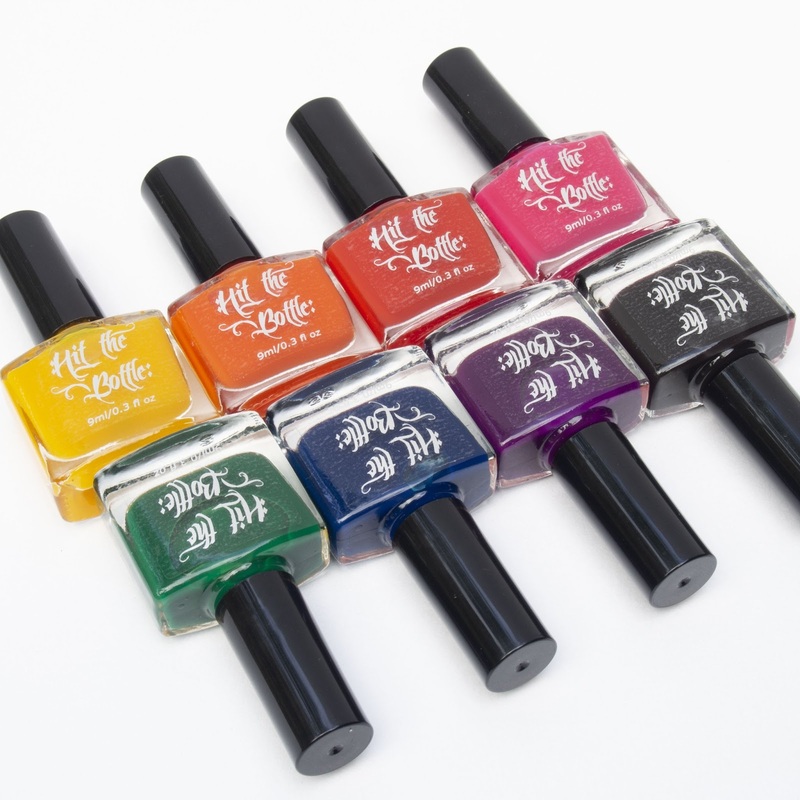 Like with Ginger Ninja this polish is great to wear alone, with nail art or as an accent nail. The formula is great and easy to use. I do recommend a careful application as this polish can be quite messy to clean up. My swatch shows two coats. How great is the Wizards And Magic Collection? There are sooooo many great polishes in the mix here. My personal favourites are Unicorn Claret, Ginger Ninja, Stan's Wheels and O Dumbledore, My Dumbledore. There are so many others in this collection that are soooooo close to being favourites of mine but I am being tough and limiting my favourites. You honestly can't go wrong with any of the polishes in this collection. They are all beautiful and have great formulas. The Wizards And Magic Collection will be available from Grace-full Nail Polish on Sunday 24th February at 8pm AEDT from both the Australian site and the international site.